Here we have the stunning Triumph Trophy SE which is a 1215cc full touring bike, finished in metallic black! This beautiful machine has just 7,362 miles on the clock from new, & is in lovely condition. These bikes are top of the range & come fully loaded. As standard you have a power screen, heated grips & heated seats for both rider & pillion. You have a radio with USB, Bluetooth, & cruise control. This particular example also has WP suspension with 3 rider settings (Normal, Comfort & Sport) along with ABS & traction control. The on board computer has lots of information so if you like our bikes with technology then you'll love this Trophy, as it also has a tyre pressure display along with electronic headlight adjustment. You have power 12v power sockets in the rider lockable pocket where the USB is & also socket in the top box for on the go charging. Full colour coded luggage, new Michelin tyres fitted & it is of course a shaft drive! You won't get bored of this one! 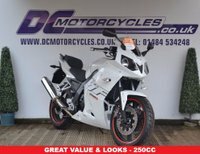 Established in 1980, DC Motorcycles is one of the longest established motorcycle showrooms in the Huddersfield area. 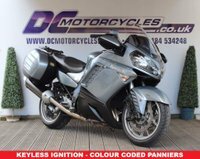 In stock are many New & Used bikes, & we offer finance with MotoNovo Close Brothers & Black Horse, so finance can be arranged & settled on your behalf. We also have full workshop facilities available. There is a full stock of clothing, protective equipment & many accessories on our top floor so why not pop in for a coffee and browse our stock in our purpose built showroom.